A few weeks ago we visited our local Ikea and found a lazy susan that I thought would fit perfectly in our corner cabinet in the kitchen. I love those cabinets in new homes were they have built-in rotating shelves in their corner cabinets to maximize space usage. So we took home the lazy susan and found that it fit perfectly in our cabinet. 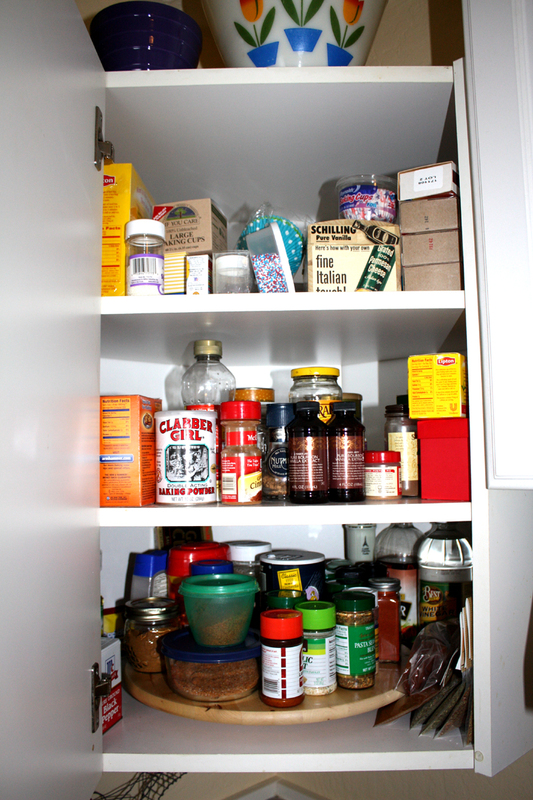 Here you can see a picture of the bottom shelf so nicely organized. 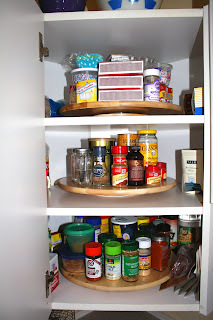 It works really great, instead of trying to cram everything towards the front of the cabinet and still not being able to see everything, you can just spin the rack around and see all your spices. Very handy. Since the one worked so well we went back to Ikea and bought two more for the top two shelves. And here you have all our spices and baking needs all arranged. While arranging everything I found that I had a few duplicates........who needs three containers of cream of tartar! I know I like snickerdoodles and meringues but really is that necessary! 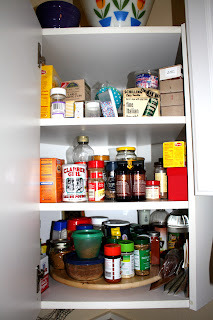 So hopefully with this new organization we will save a bit of money by not buying duplicates AND get to use all the spices we do have that I may have forgot about as they were hidden in the back.